Top 5 reasons why the Kohler 20RESA is the best! There are many reasons why the Kohler 20resa is the best and here are 5 of them. Lets start with the obvious, the polymer case. This case will NEVER rust! Unlike other generators on the market some use an aluminum case but still use a steel base plate which will rust and will need to be replaced. The Kohler 20resa case is completely UV resistant. Even the battery sits in a polymer compartment. Have you ever seen a battery leak all over its metal housing? West Coast generators has seen it many times, it destroys the base plate. Brushless Permanent Magnet Alternator. This means there aren’t any brushes to ever wear out. This alternator can sustain 300% of the house load for 10 seconds prior to transfer. It also has a higher heat rating then most brands. Low Sound Signature. Kohler measures the sound level from multiple points around the generator and based on those measurements, this generator has the lowest levels. Competitors only take their best sound level from one point. OnCue monitoring software. 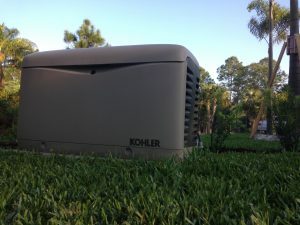 The Kohler 20resa can be connected to the internet so you can monitor your generator from anywhere via your computer or smart phone. Plus there are no yearly fees, unlike their competitors. You can get real time updates as well as the exact status of your generator. Made in the USA! This generator is completely assembled in the USA using parts made in the USA. West Coast Generators has toured the plant in Kohler, Wisconsin, and it is an awesome establishment!